You have a ring on your finger, excitement is in the air and the count down is on ‘til your party of a lifetime. Wow! So much wedding planning to be done, where do you start? Firstly BREATHE. Now allow yourself to enjoy being engaged with your fiancé. Wedding planning does not have to be stressful, if you take it step by step and keep a level head you will get through it beautifully and avoid bridezilla-dom. Spread the news! Buy the engagement ring if your finger isn’t already ‘blinged-up’. Placing a notice in the newspaper is a classic way of announcing your engagement and provides a valuable keepsake for your wedding album, but most couples will spread the word quickly via Facebook, twitter and instagram. Just be sure those closest to you know before they see it on their newsfeed! Buy a dedicated wedding diary/planner like Modern Wedding Planner so you can keep track of all your upcoming appointments, quotes, phone numbers and ideas. Sign up to our free wedding planning tools for a comprehensive interactive checklist, budget manager, guest list manager, seating planner and supplier shortlist so you can make a record of all your favourite suppliers. Even though everyone has been informed there’s nothing that will bring it home quite like a party to celebrate your engagement. Click here for engagement party ideas and procedures. Before you decide on budget, discuss the style of wedding with your fiancé… yes he should have a say! It’s a good idea to start the engagement off on the right foot, so arm yourself with an open mind and perhaps a bottle of bubbly. It is one of the most important days of your life and also one of the most expensive. The only way to survive is to work out a detailed wedding budget. Read through our tips for setting a budget. Discuss who is paying for what and what you or your families can afford before booking anything. Settling on a date is not easy either – there are many considerations to take into account, and remember that pleasing everyone is near impossible! Grab a pen, some paper and your man and get brainstorming. 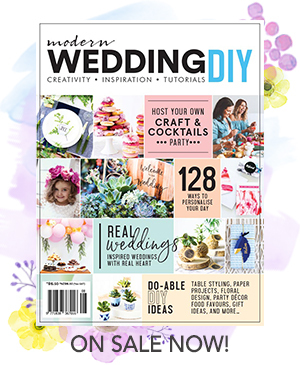 Flip through Modern Wedding magazine and browse through real wedding features to get ideas. Discuss the style of wedding you want, talk about the guest list and time of year as these will in turn determine budget and other wedding planning considerations. Decide on what is important to you both and wedding planning will be a much smoother ride. Pinterest is an absolute wedding planning MUST for brides. If you don’t already have a Pinterest account then now is the time to create one. Pinterest is the best way to collect all your visual inspiration and ideas. We’re pinning wedding inspiration every day so be sure to follow us!